Signing with Babies and Toddlers has been proven to develop early communication skills and foster early language learning. The reasons are simple--babies and toddlers are ready to speak with their hands long before they can say a word. This helps to reduce communication frustrations, crying and screaming. For most parents it is as simple as signing just a few words. Take a few minutes to watch this video clip. 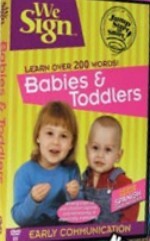 Babies and Toddlers recieve many benefits through the use of American Sign Language. Babies will begin to sign words as early as 9 months old and by fourteen months will begin to use signs for objects and things they find in the world around them. A language skill, using their hands, that enables them to express their needs, wants and thoughts long before they can speak. Vocabulary that provides communication skills to a baby that enables them to express their desires or demands, This greatly helps to reduce parental frustrations of the "whining, crying and screaming guessing game". Increased early learning due to consistent partental involvement. A fun, playful activity that all members of the family can participate in with their baby. Why does signing work at such an early age? The reasons are simple. Babies can use their hand long before they can master complex muscles needed to speak. Researches have found that "from a purely developmental point of view, babies achieve the ability to construct language with their hands at least six to twlelve months earlier than they do with their vocapparatus." Babies are physically capable of signing words much sooner than they are able to use speech. Babies are not lacking in understanding of language. "Keep in mind the principle that (babies) can understand much more than (they) are saying" (White P.92) They are only lacking in the traditional verbal means to communicate. Signing gives babies a non verbal yet real language skill that allows them to express themselves. Signing with babies has also been shown to increase vocabulary, both spoken and signed, because children who sign can elicit much more communication, many more responses and words from adults and older children around them. This provides them with a language-rich learning environment that allows them to develop, remember and use lots of vocabulary. Toddlers benefit greatly from using sign. 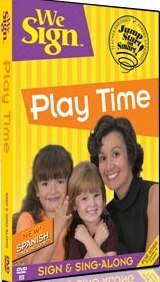 It is a fun and playful activity that involves them in their learning. Signing stimulates brain growth, develops fine and gross motor skills, increases usable vocabulary and stimulates language development. Signing with words or signing with songs provides for a varied and rich learning environment allowing toddlers to explore their world using as many of Gardner’s Multiple Intelligences as possible. Singing and signing has children learning verbally, physically, musically, visually and more.